Sen. Chuck Schumer called on the FAA to suspend the company’s operating certificate. The helicopter that took a deadly plunge into the East River on Sunday evening was the third crash in 11 years for its operators, sightseeing company Liberty Helicopters, according to reports from the National Transportation Safety Board. 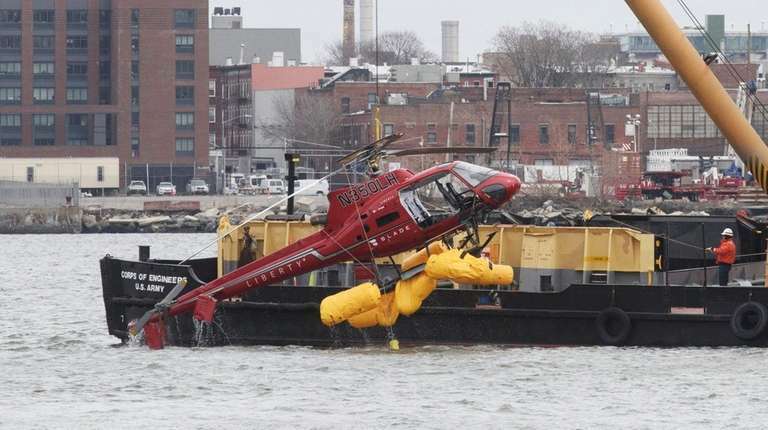 In 2009, nine people were killed when a helicopter operated by the Kearny, New Jersey-based company collided with a small plane over the Hudson River, near Hoboken, New Jersey, the NTSB reports show. Another Liberty helicopter carrying eight people on a sightseeing tour in 2007 had to make an emergency landing on the Hudson after one of its main rotor blades fractured in mid-flight. Passengers were rescued by nearby boaters and no one was injured. “I have not seen this type of accident happen,” a National Transportation Safety Board member said. And back in 2001, seven people suffered minor injuries when a Liberty chopper made an emergency landing after striking trees during a flight over Hopewell, New Jersey. After Sunday’s crash, in which five passengers died, Senate Minority Leader Chuck Schumer (D-N.Y.) called for the Federal Aviation Administration to suspend the company’s operating certificate until investigations into the incident conclude. Liberty, which describes itself on its website as “the largest and most experienced helicopter sightseeing and charter service in the New York City area,” has a fleet of 10 Airbus helicopters and has been operating them in the city since 1990. The NTSB said the 2009 crash involving Liberty, the deadliest, had two primary factors. The crash was the result of a poor flight-control policy in place known as the “see-and-avoid concept,” which put the onus on pilots, rather than airport controllers, to spot and maneuver around other aircraft in the area. The board also found that a personal phone call made by the air traffic controller at Teterboro Airport, where the plane had taken off, “distracted” the worker from properly overseeing its flight. “I just have no words to say,” Karen McDaniel, mother of Brian McDaniel, said. The crash of the Liberty helicopter into trees in 2001 was the result of poor judgment on behalf of the pilot, who made the “improper decision” to keep flying in “fog and dark night conditions,” according to the NTSB investigation. And the 2007 crash landing on the Hudson was due to a manufacturer’s error with the chopper blade, the NTSB found. The pilot involved in Sunday’s crash, Richard Vance, was the lone survivor. Vance, 33, received a commercial pilot license in September 2011 to operate rotorcraft and instrument helicopters, according to the FAA. The administration, which provides oversight of the industry, said Vance had no history of accidents or incidents. The helicopter he was piloting, the Eurocopter AS350, was also free of any past accidents or incidents. Mike Isler, an aerial technician, said he has worked with Liberty Helicopters to schedule more than 50 flights over the last 10 years for a variety of film-production jobs. He said the company had “very thorough” safety briefings with passengers before flights and had a reputation for safe travel.